Work done to vintage Daimler, Singer, and Darracq cars in 1920. Homepage. This page: Accounts for work done to a Daimler Landaulette, a Singer Coupe, and a Darracq in 1920. Work done to a Daimler, Singer and a Darracq. 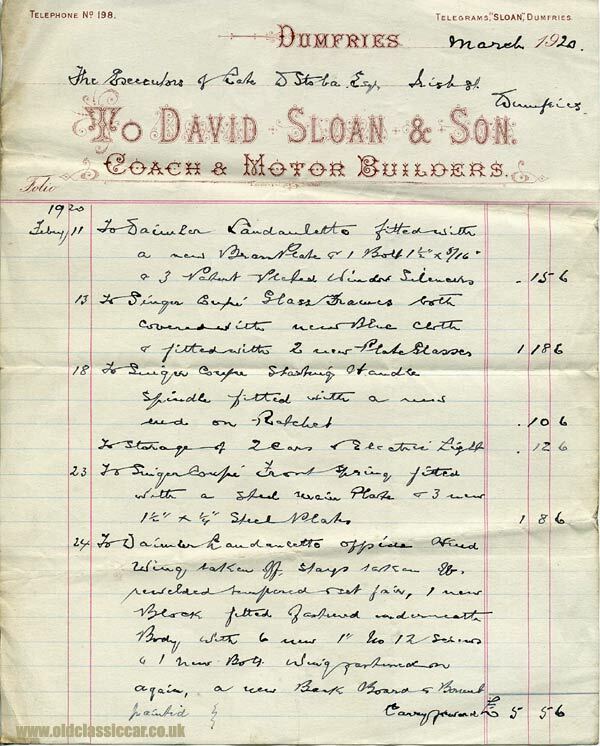 Three sheets of paperwork turned up, for David Sloan & Son - Coach And Motor Builders - dating to the middle months of 1920. Other than a telephone number and telegram address, no other details of this coachbuilding firm are provided. All three items were addressed to the executors of the late Mr David Stoba's estate, who presumably also lived in the Dumfries area of Scotland. The first sheet of paperwork describes work done to Mr Stoba's vehicles during February 1920, in particular a Daimler Landaulette, to which a new brass plate and patent window silencers were fitted on the 11th. Later in the month the Daimler received some further attention to its offside front wing, which was removed and - along with the bonnet - treated to a fresh lick of paint. A Singer Coupe also received some remedial work, including a new ratchet fitted to the starting handle. Storage charges for both cars were also applied. Page two continues with further barely-legible accounts of work done to the Daimler, in this instance the removal and re-furbishment of its nearside front road spring, which received some new leaves ("plates") before being tempered and set. A downpayment for this work was received from a Mr Carlyle, who presumably was managing the estate's affairs. The final sheet, typed this time thankfully, dates to April 1920 and relates to two gallons of petrol supplied for a Darracq, plus time spent demonstrating said motor-car to a number of people, in addition to also showing them around the Daimler, and also a Talbot. Evidently Mr Stoba was keen on his motoring, at a time when such contraptions were still the preserve of the reasonably well-to-do. The lettering on the third sheet is to a slightly different design, and "On War Office List" has been added along the upper edge. Who was David Stoba, this motoring enthusiast from Dumfries? I can find a record of someone born in 1856 at Carlaverock in Dumfries, and also a second David Stoba from the same area but born in 1860. However, as it turns out, neither is correct, as the update added in 2014 below confirms. Unfortunately the registration numbers of the vintage Darracq, Talbot, Daimler Landaulette and the Singer Coupe aren't mentioned, so where they ended up isn't known. Update regarding the aforementioned car owner. 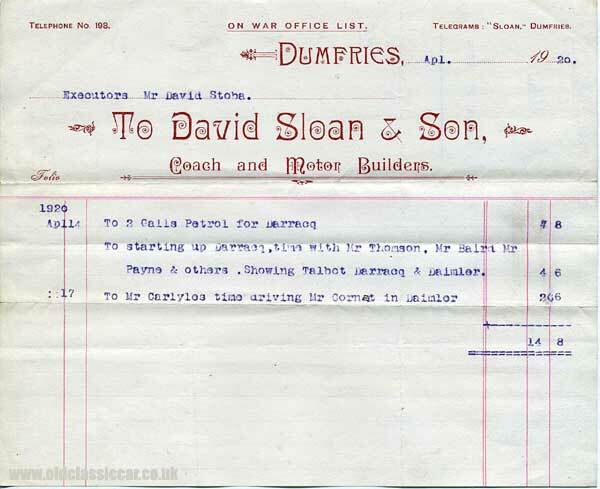 "I have come across an interesting reference to my Great Uncle David Stoba, in your post about work done on 3 cars by David Sloan of Dumfries in 1920. David Stoba was a solicitor in Dumfries who died on 7 March 1920, aged 34. The family originally came from Caerlaverock, and by 1920 he appears to have been quite prosperous. He died suddenly, and was unmarried. The inventory of his assets after death says that he had an interest in David Sloan's company, and that the cars were sold for 2145 GBP - see no. 7 on the sheet attached. I hope this is of interest to you!" It is indeed of interest, many thanks for sending over your notes, I always welcome such background information about items on the site. 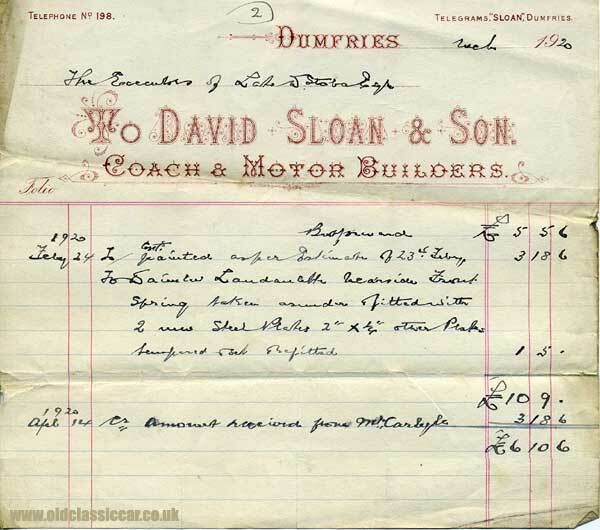 The business is referred to as Sloan & Carlyle, Motor Engineers, Dumfries. As they were dated March and April 1920, the invoices were raised just a matter of weeks after his death. His collection of cars must have been extensive.